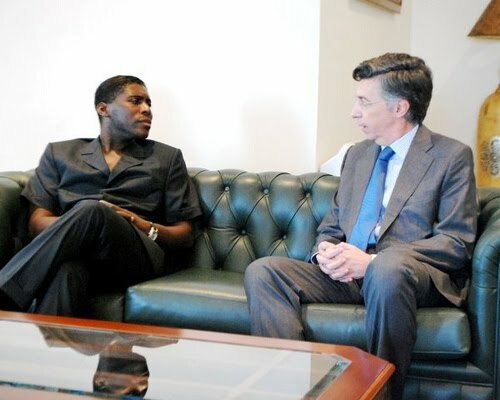 Equatorial Guinea's (Republica de Guinea Ecuatorial) Minister of Agriculture and Forestry, Teodoro Nguema Obiang Mangue, has met with the Ambassador of Spain, Manuel Gomez-Acebo, to discuss opportunities to cooperate on the development of Equatorial Guinea's agriculture sector. Among those opportunities discussed were Spain's university-level scholarship program in agriculture, a field in which Spain has a particular expertise, and increased foreign investment. A key initiative of Minister Nguema Obiang Mangue is to build Equatorial Guinea's agriculture sector as a way to promote economic diversification in Equatorial Guinea, as well as job creation for the country's citizens. In the meeting with Spain's Ambassador, Minister Nguema Obiang Mangue cited numerous opportunities for Spanish investors and reiterated the Ministry's support of foreign investment. Minister Nguema Obiang Mangue further discussed the diverse geographic and climatic conditions in Equatorial Guinea, both on the island of Bioko and the continental area, which require an in-depth study to better understand opportunities that exist and to identify agricultural products that would thrive in each region. The Minister of Agriculture agreed that Spain could bring to bear its experience in Equatorial Guinea to help find solutions for each region. After the meeting, Minister Nguema Obiang Mangue thanked Ambassador Gomez-Acebo for his visit and congratulated him for the achievements of the Spanish team at the 2010 World Cup in South Africa.